The Wits Choir comes back to South Africa with high spirits after a morale-boosting tour of Europe. 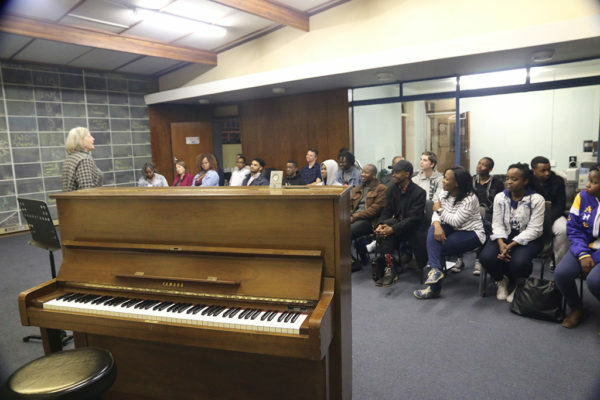 The Wits Choir returned to South Africa on July 18, after a morale-boosting 21-day tour of France and Germany. The choir had 11 official performances and a number of unofficial performances where they sang purely African music for European audiences. “As ambassadors for both the university and Africa, I think that was educationally very important for the European audiences because their concept of African music is clapping, ululating and dancing,” said Dalene Hoogenhout, the choir conductor. She also mentioned that the choir had standing ovations for all official and unofficial performances. The touring 21 choir members personally contributed a third of the funds for the tour, according to Hoogenhout. The rest of the money came through fundraising initiatives, which began in January. Hoogenhout told Wits Vuvuzela that she had planned the tour to boost the morale of the choir, after a long break of practices and performances as a result of the 2016 #FeesMustFall protests. Arts student and choir member. “So, all of the time missed and all that happened during the movement really lowered the morale of the choir. “I can safely say that now that we have embarked on this tour, sang for all the audiences and have spent quality time traveling, learning, exploring, and sharing together, we have returned a much stronger choir, both as musicians and as colleagues,” Siboto said. The choir, which was established in 1962, plans to celebrate its 55 years with a gala concert later in the year. Gala concerts that had been planned in 2015 and 2016 had to be cancelled because of #FeesMustFall demonstrations.